Thanksgiving Day is a holiday celebrated primarily in the United States and Canada. 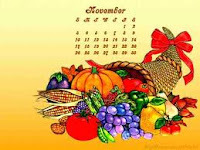 Thanksgiving is celebrated each year on the second Monday of October in Canada and on the fourth Thursday of November in the United States.In this country , the modern Thanksgiving holiday tradition traces its origins to a 1621 celebration at Plymouth, in Massachusetts. The event was celebrated to give thanks to God for guiding them safely to the New World. The pilgrims invited the native Americans to join the celebration. In 1863 President Lincoln made it a national holiday. The traditional food prepared nowadays for this celebration is: stuffed turkey with gravy, cranberry sauce and pumpkin pie.